Russell, Daniel C. 2017. Handbook of Virtue Ethics in Business and Management. p. 33. Danylova, Kateryna 2017. D. Ricardo's Legacy in the 21st century: Theory of comparative advantage through the prism of historical and institutional analysis. Ìstorìâ narodnogo gospodarstva ta ekonomìčnoï dumki Ukraïni, Vol. 50, Issue. 2017, p. 172. Freiman, Christopher 2017. Poverty, partiality, and the purchase of expensive education. Politics, Philosophy & Economics, Vol. 16, Issue. 1, p. 25. 1 United States Census Bureau, “Historical Income Tables: Household,” http://www.census.gov/hhes/www/income/data/historical/household. 2 United States Census Bureau, “Current Population Survey,” http://www.census.gov/hhes/www/cpstables/032012/hhinc/hinc01_000.htm. 3 Cox, W. Michael and Alm, Richard, Myths of Rich and Poor: Why We’re Better Off Than We Think (New York: Basic Books, 1999). 4 United States Department of Treasury, “Income Mobility in the U.S. from 1996 to 2005,” http://www.treasury.gov/resource-center/tax-policy/Documents/incomemobilitystudy03-08revise.pdf. 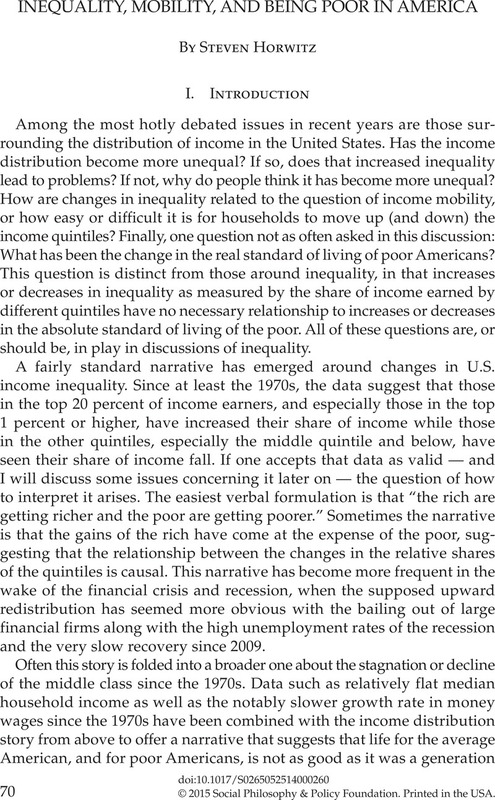 5 Díaz-Giménez, Javier, Glover, Andy, and Ríos-Rull, José-Víctor, “Facts on the Distributions of Earnings, Income, and Wealth in the United States: 2007 Update,” Federal Reserve Bank of Minneapolis Quarterly Review 31, no. 1 (2011): 2–31. 6 Julia B. Isaacs, “Economic Mobility of Families Across Generations,” http://www.brookings.edu/∼/media/research/files/papers/2007/11/generations%20isaacs/11_generations_isaacs.pdf. 7 Scott Winship, “Has Rising Income Inequality Worsened Inequality of Opportunity in the United States?” in the present volume. 8 “Statistical Abstract of the United States: 2009” http://www.census.gov/compendia/statab/. 9 Russ Roberts, “Inequality and Stagnation,” http://cafehayek.com/2012/02/inequality-and-stagnation.html. 10 Don Boudreaux, “We’re Much Wealthier,” http://cafehayek.com/2006/08/were_much_wealt.html. 11 W. Michael Cox and Richard Alm, Myths of Rich and Poor, 55. 12 Cox and Alm, Myths of Rich and Poor; Don Boudreaux, “Working for Sears,” http://cafehayek.typepad.com/hayek/2006/01/working_for_sea.html; Mark Perry, “When it Comes to the Affordability of Common Household Goods, the Rich and the Poor are Both Getting Richer,” http://www.aei-ideas.org/2013/10/when-it-comes-to-the-affordability-of-common-household-goods-the-rich-and-the-poor-are-both-getting-richer/. 14 Cox and Alm, Myths of Rich and Poor. 16 Cox and Alm, Myths of Rich and Poor, 26. 17 United States Census Bureau, “Extended Measures of Well-being: Living Conditions in the United States, 2005,” http://www.census.gov/population/www/socdemo/extended-05.html. 18 Hassett, Kevin and Mathur, Aparna, “A New Measure of Consumption Inequality,” AEI Economic Studies (Washington, DC: American Enterprise Institute, 2012): 1, http://www.aei.org/files/2012/06/25/-a-new-measure-of-consumption-inequality_142931647663.pdf (2012). 20 Hayek, F. A., The Constitution of Liberty (Chicago: University of Chicago Press, 1960), 43–44. 21 Zywicki, Todd J., “An Economic Analysis of the Consumer Bankruptcy Crisis,” Northwestern University Law Review 99 (2005): 1463–1542. 22 Emmanuel Saez, “Striking it Richer: The Evolution of Top Incomes in the United States (Updated with 2012 preliminary estimates)” http://elsa.berkeley.edu/∼saez/saez-UStopincomes-2012.pdf.